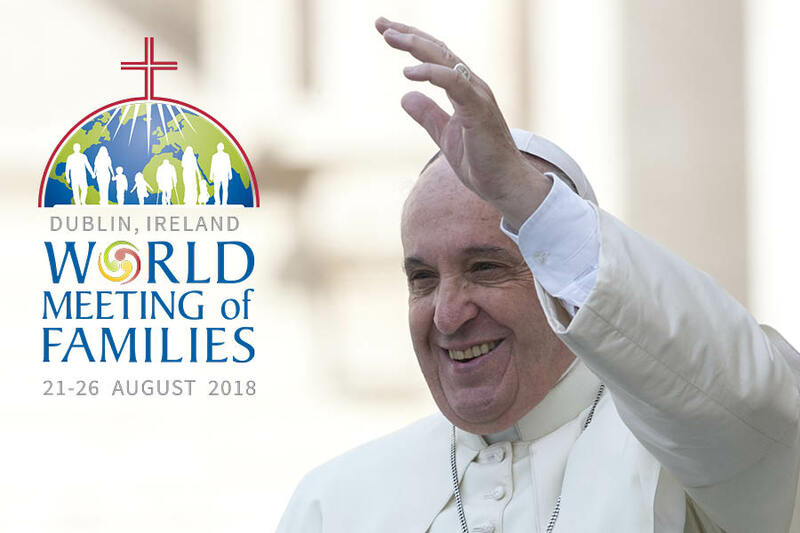 Pope Francis arrives in Ireland on August 25 where he will participate in the World Meeting of Families (WMOF) based on the theme “The Gospel of the Family: Joy for the World”, a theme Pope Francis himself chose. By Sr Bernadette Mary Reis, fsp The IX World Meeting of Families begins on Tuesday, August 21st with an opening ceremonyincluding the celebration of Evening Prayer in Dublin. Ecumenical in nature, those participating will welcome Christ as the unfailing light, join in singing and praying hymns and psalms, and intercede for the entire human family. A similar opening ceremony will take place in all the other Dioceses of Ireland. This prayer service will open the path for the entire WMOF which ends with the solemn Papal Mass on Sunday, August 26th. An icon which forms a triptych in the shape of a home when it is closed was specially commissioned and anointed on August 21, 2017. Gabriel and Michael are on the outside of the doors. When opened, the Holy Family sharing a meal is flanked by the Raising of the Daughter of Jairus and the Wedding at Cana. The icon traveled to each of Ireland’s dioceses and is accompanied by the petitions written by Irish families who have venerated it throughout the year. Éirinn, a Galway sheep in the form of a cartoon character, is the WMOF mascot who will be welcoming all the children. The official prayer is available in 17 languages. “A Joy for all the World” is the WMOF official hymn and was is based on Pope Francis’ Apostolic Exhortation Amoris laetitia. Family stories and anecdotes featuring WMOF staff, volunteers, and participants are captured in an online collection called Humans of WMOF2018. Pope Francis’ predecessor, John Paul II, initiated the WMOF in 1994 when he asked the then Pontifical Council for the Family to institute an international event. His desire was that families around the world could join in prayer, catechesis and celebrations in order to be strengthened as families in bearing witness to their particular vocation in the Church and society. Pope John Paul II participated in four WMOF in Rome (1994), Rio de Janeiro (1997), Rome (2000) and Manila (2003). His successor, Pope Benedict XVI participated in three – Valencia (2006), Mexico City (2009) and Milan (2012). Pope Francis’ first WMOF experience took place in Philadelphia in 2015.